I got inspired last night when I saw this journal cover on Flickr. I am always amazed at how different mine turns out even when I think I am copying an idea. I glued a page from one of the books I made into an altered book to the front and back covers before I painted them. The paint stuck a lot better than it usually does to the composition book covers. 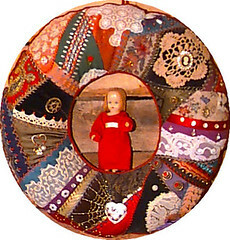 The flowers on the front of this are special to me because they were on a fabric bulletin board/collage that hung in my bedroom for years. I took it apart when we changed colors in the room and saved the things that were on it. These were so old and brittle that the paper sort of broke apart as I was cutting it in places. 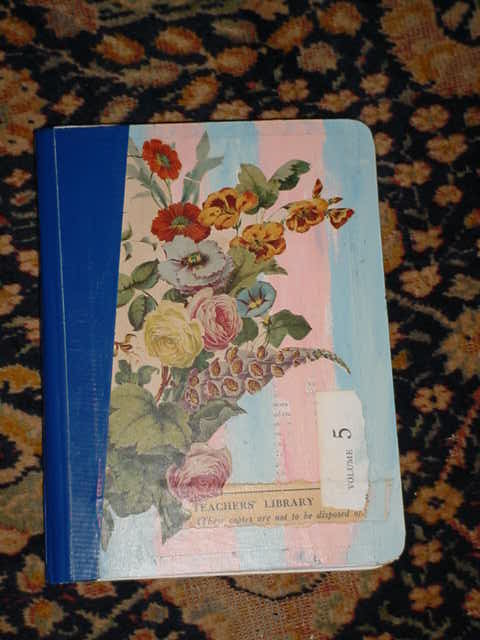 The back has more of the flowers and some bits cut from old sheet music books. I just bought the blue duct tape at Wal-mart. I like the way it looks on the spine. Yours looks much better than the one on flickr that was your inspiration. I really like it although I usually don't like flowery and pinkish things. Ah, the joys of vibrantly hued duct tape! Thanks Swan. You know pinkish things normally aren't my thing either. I seem to be drawn to pink and light blue lately though. Might have something to do with the pink tutu and hat and scarf I'm making my granddaughter. I was blessed with seeing a beautiful sunrise the day after I made my cover in exactly the same shades. Now when I see it, I'll think of the sunrise too. I think your cover looks beautiful and I prefer it to the one that inspired you, too :-). Thank you. I'm sure enjoying having the cover done while I work on the journal. I usually wait til near the end or after I finish to decorate the cover. 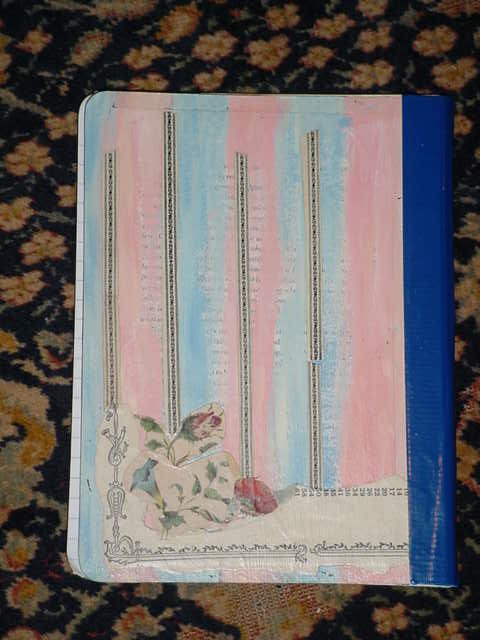 I always decorate my journal or altered book covers first, before I start working in them. I don't know why, I just prefer to do it that way! I just had another look at your lovely journal cover and it reminded me of the style of the British textile designer, Cath Kidston. I LOVE her designs, but her products are very expensive here in the UK. Thanks for keeping this journal, I really enjoy it.